Taste the fruit of band recorded winning all against the hour: quintessential prog ensemble captured on the edge of glory and presented on Blu-ray. For many years, YES were being both blessed and blamed for bringing out the best and the worst in art-rock – of only because, through the multitude of line-up permutations, they have always stood out, sonically and visually. For many fans, though, “Yessongs” – shown in cinemas in 1975 yet filmed on December 15th, 1972 in London – was the only chance to actually see the collective; even for those who attended concerts but didn’t manage to get near the stage. The classic quintet’s first concert film allowed to enjoy almost every detail of what they did, so even if it omitted a few precious pieces played then – “Heart Of The Sunrise” would make a dramatic change to the footage flow – it still remains a priceless document of the group’s transition from progressive beginnings to greatness and immortality. Captured here, these virtuosi, instead of being infamously indulgent, seem to be reining in their flamboyance as performers, and in place of impeccable brilliance this ensemble are known for we witness quite a raw band bent on giving the spectator vigorous music without relying on elaborate stage sets which simply weren’t there yet to add light and color to the darkened space. Hence Chris Squire‘s leaps and Steve Howe’s demonic attack on instruments – he’s playing slide guitar while having a double-neck on for the main theme of “And You And I” – but then, the live building of intricate vocal harmonies, especially the counterpoint between Squire and Jon Anderson, the group’s founders whose melodic weave defined the collective sound, reflects their inherent art leanings, despite the singer looking not as self-conscious and sophisticated as he would a litle bit further down the line. Anderson is a sole island of humanity amidst otherworldly intensity of “Close To The Edge” – the titular epic from the album the band were promoting at the time – although Rick Wakeman, playing in front of a giant mirror with a straight face, weaves “Jingle Bells” into the “Six Wives” excerpts and provides an earthly kind of entertainment. The line-up, who only recently acquired drummer Alan White, feels very loose on “Yours Is No Disgrace” – one of the earliest numbers in the group’s repertoire – and the organic nature of what they do is stressed by footage of nature which intersperses concert shots; more so, a lot of this footage has to do with growth which stresses the group’s own creative development. That’s where their progressive motion is being brought to the fore, although – from opener “I’ve Seen All Good People” to the finale of “Roundabout” – they’re as eager to revert to the band’s rhythm-and-blues roots and rock away. 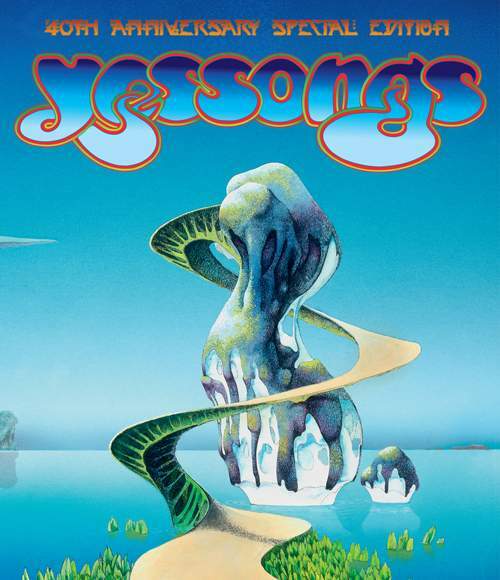 This quality would soon be gone for good – that is why “Yessongs” is so special. The Blu-ray release adds a surround mix to the original mono; the 40th anniversary documentary expanding the context via interviews with Chris, Steve and graphic designer Roger Dean; and Howe’s “Beginnings” featurette – a genuine gem, restored rather gloriously, which, unfortunately can’t be said of the main footage. But, again, from a purely historical – and musical – perspective, it’s impossible to underestimate.